I'm writing this up on Sunday, and it feels as if Fall has passed us by and we moved right into early winter. The high today was only 52 and it was overcast and rainy too. Definitely soup weather. It's going to warm up this week, but in the seasonal 60s. Monday - Chicken Soup, bread and salad. The soup is actually chicken stock I made in the spring, that I plan to defrost. I'd love to get the energy to make home made noodles. . .
What's on your plan this week? For inspiration or to link up your own meal plan, visit I'm an Organizing Junkie. 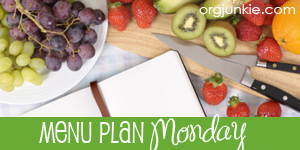 Stopping by for a blog visit from Organizing Junkie's Menu Plan Monday today! Everything for this week's menu plan sounds so wonderful. I placed acorn squash on our grocery store delivery. It's one of my favorite fall vegetables. I love this time of year when the temps have cooled down to something liveable in Las Vegas! When I opened our coat closet I didn't get hit with a blast of heat today. Now that's much better.